The Earthly Sanctuary or temple studied earlier in Section 8, was a symbol of God’s work in the Heavenly Sanctuary or Temple. There was a yearly "Day of Atonement" in God’s earthly sanctuary timetable when the earthly sanctuary was "cleansed". This represented a time of special cleansing of the Heavenly temple. How could this be? The Bible says that there is a record in Heaven made of every thought, action or motive. When we ask for "forgiveness", pardon is written by our name. We can rejoice that we are totally forgiven and clean. But, the forgiven record of our actions must still be in God's records until our name comes up in Heaven’s final judgment. [2 Corinthians 5:10,11] The Bible makes it very clear that everyone’s name comes up in the Heavenly Judgment. 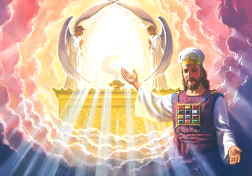 Before Jesus returns, the Heavenly Court must go to each persons’ name who has accepted Jesus. The Universe must see that they are "safe to save". When taken to Heaven, this saved person will not infect (spread) sin into the Universe. 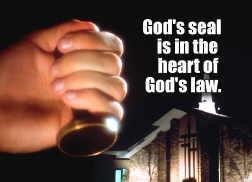 Each saved person must be "sealed". Perhaps we could say -- they must receive a type of "clearance slip" showing they are ready and safe to go to Heaven. 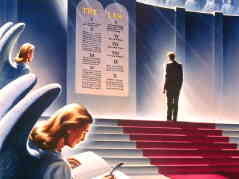 The Heavenly Court is judging each man by the law of liberty, the Ten Commandments. These Ten Commandments are summed up as love to God and love to Man. However, in the middle of that law God has placed a sign of loyalty to Him in His seventh-day Sabbath. The Sabbath is a reminder of Creation, and of the new creation that Jesus makes in our hearts. Satan hates this sacred reminder. Through the years Satan has worked against God's law and the Sabbath commandment in every way he can. God talks about a seal in Revelation that must go on the forehead (or in the mind) of everyone who will be saved. [Revelation 14:1] These people are God's final "Remnant" (His last people) on earth. Also, there is a Mark of the Beast (seal of falsehood) that everyone receives who does not receive God’s seal. [Revelation 14:9] In the final hours of earth’s history, Revelation says that those who are sealed keep all God's commandments. [Revelation 14:12] So then, those who receive Satan’s "Mark" are the people who have refused to keep God’s commandments and God’s true Sabbath. This is a deep, but very important study. It is extremely important to all of us today, for Jesus Second Coming must be very near. If we are alive when Jesus returns, each one of us will either have God’s Seal or Satan’s Mark. Some of the strongest words in all the Bible in Revelation 14 apply to those who receive Satan’s Mark. It is very important that we understand what is involved. Surely, none of us want Satan’s Mark! God wants to help prepare man physically, mentally, socially and spiritually for Heaven and the challenges ahead. God gives a wonderful message about how to have the best health to prepare for the future challenges. Go to the Next Section: God's Final Call To Man to learn about God's Final Call.